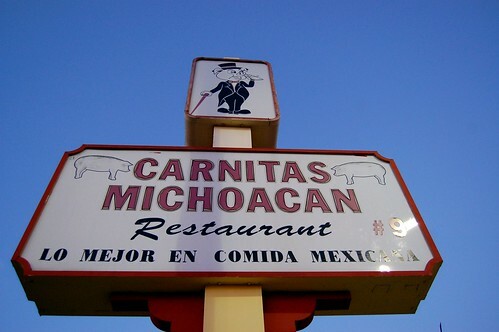 When we came back from Catalina Island, we stopped by for a quick bite at Carnitas Michoacan No. 9 (31 W. Broadway, Long Beach). How could we resist a pig in a top hat? The place was dark, dingy, and decorated with fake flowers. Mr. Monkey's large horchata ($2.50) was quite delicious. Mr. Monkey ordered three tacos ($2.10 each for hard shells) -- carnitas, al pastor, and cabeza. Yes, cabeza. 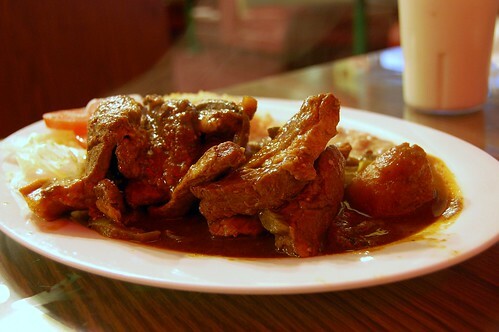 You may know these things as "pork," "adobo pork," and "beef cheeks." I found the cabeza a tad too fatty for my taste. Everything else had a nice rich flavor. I got the chuletas con nopales ($7.50). That's "pork chops with cactus." Could've been more tender, but yummy nonetheless. I ate the other half for lunch the next day. Still good reheated. 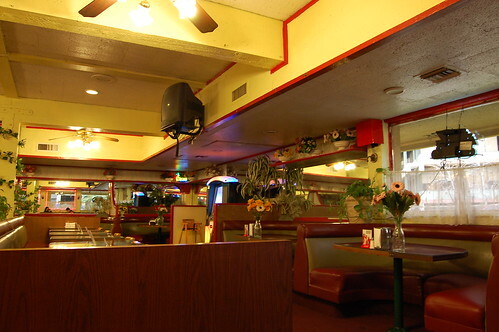 Do y'all yelp (or some other internet tool) to find these restaurants or just allow yourselves to stumble upon them? We just stumbled upon this one! This happens a lot with our hole-in-the-wall visits. I'll often learn about nicer restaurants on other blogs or publications. I like reading those more than yelp or Chowhound. People get a bit pretentious on those sites. Turns me off. Uh, are you sure Mr. Monkey's fatty taco was "beef cheeks?" That's not the part of the cabeza that I associate with tacos de cabeza. 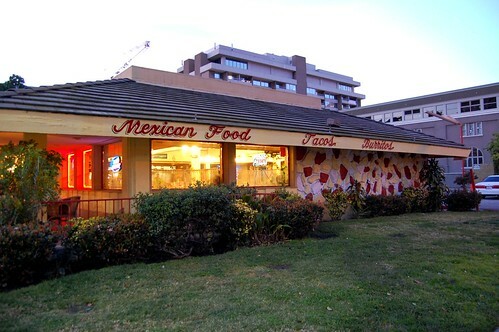 Hmmm Mexican food sounds so good right now. That building looks like an IHOP! oooh this place looks tasty. 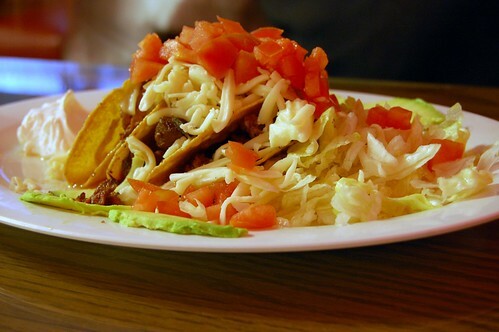 i love all sorts of mexican food. A pig in a top hat at a Mexican food place? How random and funny. You're right, it's a must stop. I work in downtown LB. I drive by this place every day but have never eaten there. I need to try it out with one of my more adventurous coworkers. 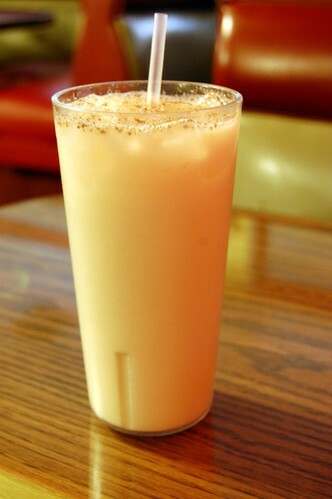 i'm drooling at that horchata. yum!